Technology in innovation can bring innovations and that is exactly reflected in Samsung ATIV Smart PC, which combines the power of in terms of convenience of a tablet, portability of a laptop and computing power of a Personal Computer. ATIV in the device can easily transform notebook PC to a tablet PC device merely on a click of a mouse. 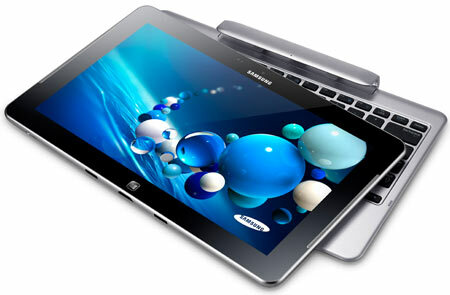 Designed for windows 8 Samsung ATIV Smart PC provides an extraordinary productivity and mobility. The 11.7 inch Samsung ATIV Smart PC is compatible with Windows 8 as well as Windows 7. It has a set of devices as detachable keyboard-docking system that allows users to move between a clamshell notebook PC and a tablet PC form factor. Thus the device products the maximum productivity added with the greater mobility. Beyond the two finger touch features, the device has an advanced 10-finger multi touch screen giving a technological advantage. The ten finger touch screen system allows the ease of pinch-to-zoom, rotate images and scroll through and across images. The device has also a USB2.0 and USB 3.0 slots along with mHDMI and miniSD. The battery life is 13.5 hours for ATIV and ATIV it is 8 hours. Its chasis is sleek and cool and is sophisticatedly are powered with Intel Core i5 processor the technology is updated and is state of the art. Its Display is 11.6 full HD. The price of ATIV smart PC pro is 1500 $ and the ATIV Smart PC is at 1100 $. The storage capacity of the device is 128 GB.